Did you know the average cost of a college education is anywhere from $12,000-$30,000 dollars, depending if the school is private or public. Places like Harvard or Princeton the cost is nearly $100,000. Getting low interest rate student loans is crucial. What most students don’t realize is there are several options for low interest student loans. The Stafford Loan is a federal both an unsubsidized and subsidized loan which is available to all students regardless of credit history or debt to income ratio. It’s based solely on financial need for the subsidized (meaning the government covers the interest). There is a limit to this loan of, per year, at the time of this writing, is: $9,500 for 1st year students considered freshmen, $10,500 for sophomore students and $12,500 for juniors and seniors both (according to the Department of Treasury). Students are responsible for paying back these loans once they graduate or are not enrolled in school. The payments begin anywhere from 6-9 months after enrollment ends or the student graduates. The loans are available in higher amounts for those students in graduate school. The Perkins Loan is financed through the school. It is money given to the school directly in limited quantities to be dispersed directly from the student financial aid office. The Perkins loan has a limit of $4,000 and is not taken directly from the Federal government. 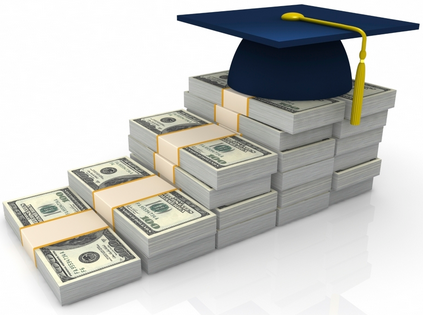 Both of these types of loans are dependent only on the student’s financial needs. While the Stafford can be taken by any student, a financial hardship is needed for the Perkins loan. The benefit of both of these loans is they are available regardless of poor credit and they are very low fixed interest. They are also deferred while the student is enrolled, although interest does accrue. Since there is a cap on financial aid totals with both the Stafford and Perkins loans, many students must take out another loan to cover their tuition. The last type of loan available to students directly (unlike the PLUS loan which is available to parents of students) is a private loan. Unlike federal loans, private loans are dependent on the borrower’s credit history. There are private loans for bad credit borrowers, but the interest rate is incredibly high. I recommend repairing credit before applying, if the extra financial need is there. Private loans have variable rates of interest, but generally the same terms of payment as federal ones. That means that the private loans must be used for only school related things and that payment is deferred while the student is enrolled in school. Private loans also accrue interest from the day the borrower accepts the money. The benefits of a private student loan are that they are much higher amounts and the money goes directly to the student, not the school. A low interest student loan is easy to get if you have good credit. The best option is to shop around and find a lender willing to give you the best terms, like fixed interest, low–cost or not fees and low origination fees.